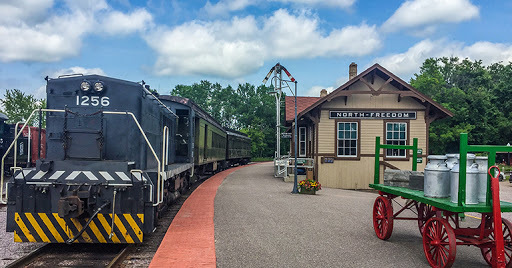 West of Baraboo, in the beautiful scenery of the Baraboo Range, the small town of North Freedom chugs to life each morning as tourists and railfans line up to ride a vintage train. The Mid-Continent Railway Museum displays restored rail cars, steam engines, diesels, snowplows, a vintage depot, and a village of restored railroad related buildings. 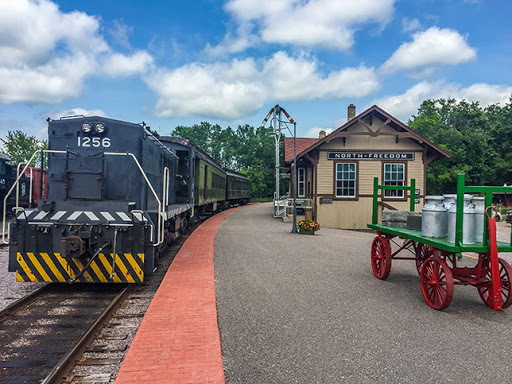 The highlight of a visit to the Railway museum is the chance to ride in vintage railcars on various themed adventures from the Pumpkin train to the Beer and Pizza Train. 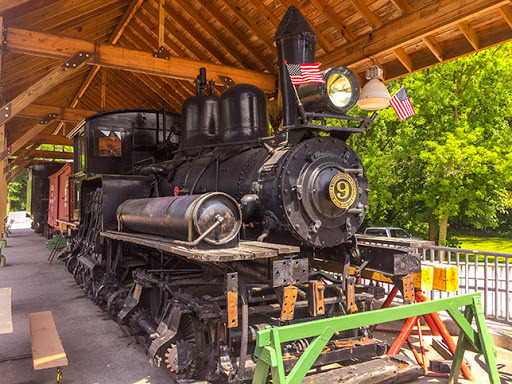 With close proximity to the tourist mecca of Wisconsin Dells, the trains at North Freedom are abuzz with laughing and smiling families on any given weekend. 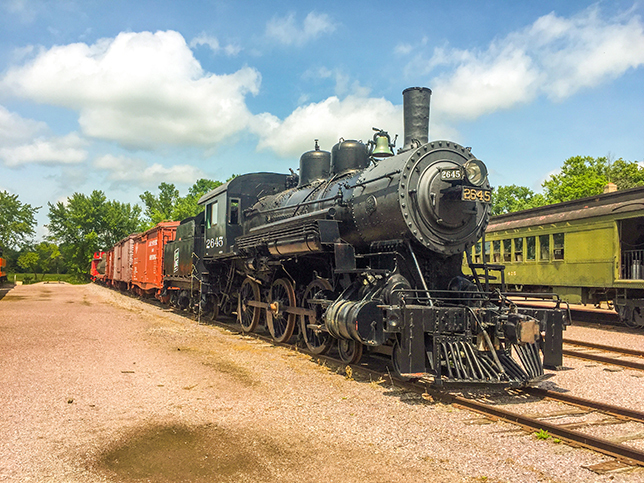 Visit the Mid-Continent Railway Museum Website to check out schedules and fees. Chicago's first railroad was the Chicago & North Western, and one of its lines happened to run through North Freedom. The era of railroads were a boon to towns like North Freedom. The railroads propelled towns like these along with the entire nation to manufacturing and economic dominance. 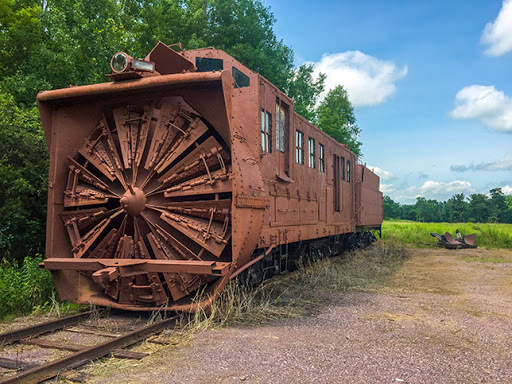 Being one of the pivotal innovations in human history it is little wonder that steam powered transportation captures the fascination of so many. Today, rail transportation has been joined by other more flexible transportation methods which have led to the decline of railroad culture. The Mid-Continent Railway Museum seeks to preserve pieces of that bygone era. 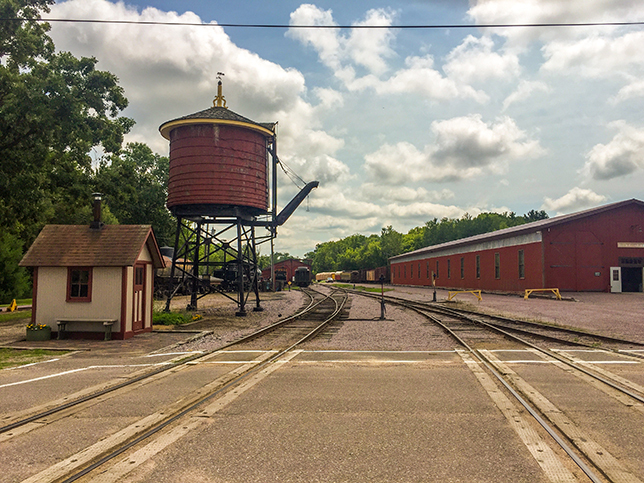 The Railway museum began in Milwaukee as an effort to restore engines and wood sided cars. 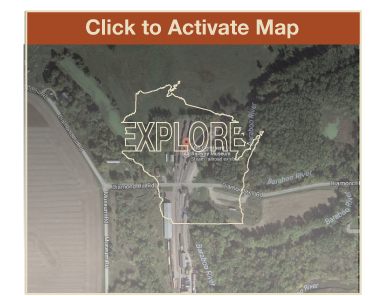 But, the opportunity to purchase the Rattlesnake Spur from Union Pacific encouraged the group to establish the museum at North Freedom. On this spur they could run steam locomotives and carry passenger cars of tourists through the mountain like scenery of the Baraboo Range. The museum itself is fee free. You can walk the grounds and inspect the restored giants of America's industrial revolution. 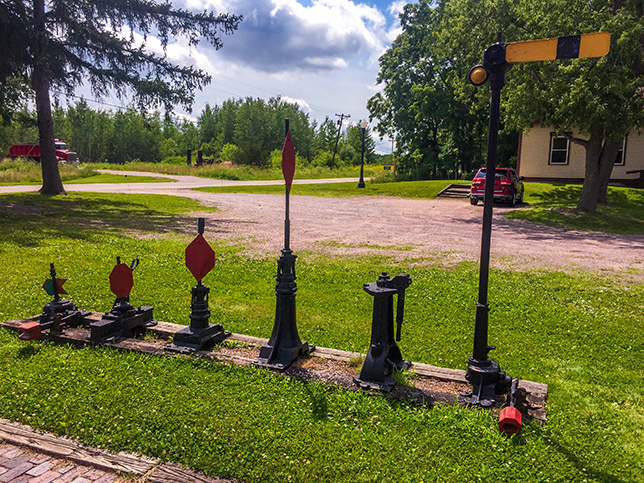 You begin your tour at the former Rock Springs Depot which was moved and restored at the Museum. Then spread out to the campus of locomotives and engines that includes other buildings like the freight house and water tower. There is an indoor coach house that houses wood sided rail cars. And, beyond the public viewing areas are the restoration shops. 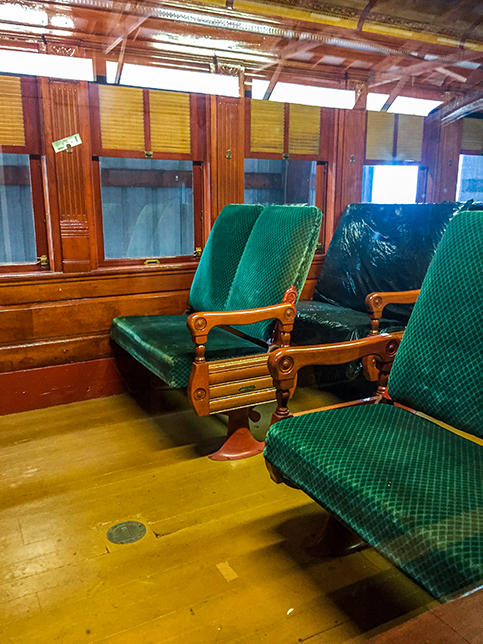 Touring the grounds is a fascinating adventure in itself, but the main draw of the museum is its regular train rides. The train runs on the Rattlesnake spur through woodsy scenery out to old quartzite mine. These trips are fun for the whole family. But, special trips are scheduled year round that appeal to more mature audiences. Special trips include: A Wine Train, a Beer and Pizza Train, a Fall Colors Train, and a Winter Snow Train. Riding the train and touring the museum will make you long for the more social times of the past when communities gathered at their proud depots to welcome their families home. The Mid-Continent Railway Museum preserves a slice of Wisconsin's glorious industrial past and a culture that was forever changed by the enormous network of rails that connected every small town to every large city. An established 1 mile double loop hiking trail brings visitors to Ableman's Gorge into a former quarry and up close to the ancient quartzite rock faces. One of the busiest freight rail transport intersections in America, the double cross in Rochelle Illinois has long drawn railfans from far and wide. With 100 plus trains traveling daily through this point you are sure to get up close and personal with a hulking giant of human engineering.